Check their water regularly in case of freezing. It may be handy to have a spare Glug or drinker that you can swap over if it has frozen solid. Shut your hens in their Eglu a little earlier in the evening, so that you don’t forget to do so when it’s too dark. They will keep nice and snug inside. Soggy weather can lead to a muddy area under the run. Covering the area in bark chippings will help to prevent it becoming too muddy, and one of our Eglu Covers will give your hens shelter from the rain. Freezing temperatures can lead to painful combs and wattles. Ensure they are protected with a good layer of Petroleum Jelly or Comb and Wattle Protector. And finally, don’t go sharing your Christmas choccies with your chickens, but do treat them to some tasty leftover veggies from the Christmas dinner. They’ll love it! It may be looking pretty unlikely that we’ll get a white Christmas this year, but if you want to turn your garden into a winter wonderland we’ve got just the thing – The Eglu Winter Sticker Set! 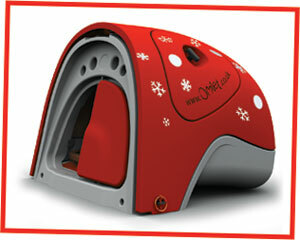 Adorn your Eglu with snowflake and snowball stickers and it will look like it’s been caught in a Winter shower. Add as many or as few as you like and decorate to yout heart’s content. The stickers are fade and peel resistant so they will look brilliant throughout the Winter, and when you are ready for a change simply remove them or swap for our flower or butterfly stickers. This sticker set will turn your Eglu into a Winter Wonderland for chickens! We don’t want to interrupt your Christmas celebrations this year, but here’s a bit of advice…make sure you check your inboxes on Boxing Day for an offer that is eggstra special. If you’re thinking about keeping chickens in 2012 you won’t want to miss it! We’ll say no more..